Robots are loads of fun to play with, but despite the prevalence of easy-to-use microcontrollers like the Arduino, and kits to make your own bots, the barrier to entry when it comes to owning your own robot is often pretty high. Enter Romo, a robot that uses your smartphone to power everything it does. 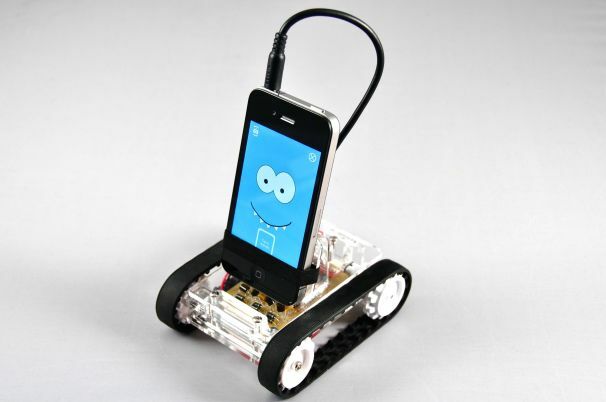 At its core, Romo's pretty simple: You put your smartphone into a clear chassis and load it up with apps to get it rolling along on a pair of tank treads. Instead of relying on a dock connector to communicate between the phone and the chassis, Romo relies on the transmission of different audio frequencies through your phone’s headphone jack. This means that Romo will be usable by both Android and iOS users, without requiring that you fiddle with adapters, or purchase a chassis that would only be usable by a specific phone. When it comes to adding specific functionality to Romo, Romotive is planning on releasing a series of apps that would provide Romo with a variety of different functions. RomoRemote turns your Romo into a remote-controlled telepresence robot, while Romo Kart will allow you to play a “mixed-reality” racing game similar to Nintendo’s “Mario Kart.” They’re also planning to release a drag-and-drop programming app that would allow you to set commands for Romo on your smartphone, and then watch as it executed them. Romo has something to say! from Romotive on Vimeo. The Romo Kickstarter project wrapped up today (Novemnber 21), so you won’t be able to pick up a Romo until they go to market, unless you got in on the pre-order. However, if you’re interested in experiencing what you’ll be able to do with Romo once you get one, the RomoRemote app is available in the iOS App Store as a free download. Blair Hanley Frank is working on removing this pesky restraining bolt.